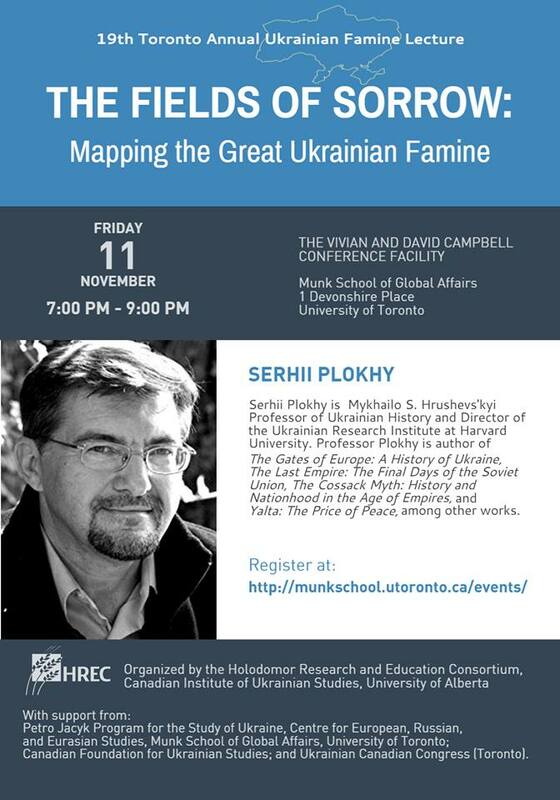 The event was organized by the Holodomor Research and Education Consortium (HREC) at the Canadian Institute of Ukrainian Studies (University of Alberta) with the support of the Petro Jacyk Program for the Study of Ukraine (Centre for European, Russian, and Eurasian Studies, University of Toronto); the Canadian Foundation for Ukrainian Studies; and the Ukrainian Canadian Congress (Toronto Branch). Professor Plokhy provided an overview of the HURI project “Mapa: Digital Atlas of Ukraine.” One of the most striking maps, “Total Direct Famine Losses in Ukraine by Region, 1932-1934,” shows that the area hardest hit by the Holodomor was the central Ukrainian heartland in the Kyiv and Kharkiv oblasts rather than the main grain-growing region of southern Ukraine, which had suffered the most during the famine of the early 1920s when the Soviet Union had accepted food aid. One possible explanation for the lower losses in southern Ukraine in 1932-1934 is that because the region had higher levels of collectivization, the population was not subjected to the same degree of punitive in-kind taxes that meant the seizure of foodstuffs. He noted that the Soviet Union was hiring Western expertise for its ambitious industrial projects such as the Dnieper Hydroelectric Station (Dniprohes) in Zaporizhia at a time when the United States was reeling from the effects of the Great Depression. The cost of Soviet industrial development including the Dniprohes venture was enormous, paid for largely by the agricultural sector. As Professor Plokhy commented, one needed only to look just beyond the boundaries of the city “to see where the money was coming from,” as surrounding villages were being squeezed of all grain to underwrite Soviet industrialization. Grain requisitioning was conducted in a brutal manner, and by 1932 people were dying – the Ukrainian Famine of 1932-33 had begun. Additionally, Professor Plokhy discussed the assault on Ukrainian cultural figures and institutions as well as Party officials that accompanied the Famine, noting that the impact of collectivization and the Holodomor amounted to the destruction of the traditional social order in Ukraine. A lively question-and-answer session followed. The maps of the HURI project “Mapa: Digital Atlas of Ukraine,” are accessible on the Internet: http://gis.huri.harvard.edu/historical-atlas/the-great-famine/famine-map-gallery.html .